Last night was the first paddle of the year and a good start to 2007. Despite a low turn out at THCC, four of us were game for a trip to Greenwich and back. We set off against what London VTS rather poetically described as the 'young flood' and made Greenwich in about 45 minutes. On the way I noticed that part of the rather decrepit Convoys Wharf appeared to have sunk since I was last there. 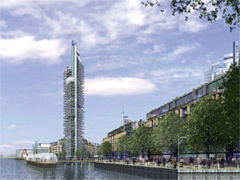 Apparently it is about to be redeveloped by the Richard Rogers Partnership. This is good news for us as it should mean more yuppies and less stone throwers! We powered back to Wapping in about 30 minutes and I felt as though I had made the first steps in overcoming the Christmas bloat.